Here in Vancouver, British Columbia, I am now witnessing what is arguably the most important energy policy debate on the North American continent today. The Kinder Morgan Trans Mountain pipeline expansion proposal is pitting province against province, and province against the federal government of Canada, in increasingly dramatic terms. Thrown in for good measure, my home state of Washington, neighboring British Columbia, has good reason to get involved in the dispute as well. The concern south of the border has to do with significantly increased oil tanker traffic, and the potential for spills right in the middle of orca territory. The prolific journalist for the Seattle Post-Intelligencer, Joel Connelly, reviews the risks here: Connelly: Dow Constantine joins B.C. pipeline resistance. The concern in the Vancouver area, where the pipeline expansion terminates in massive holding tanks, includes pipeline leaks, emissions, and fire risk to the local residents. The public health risks, which include exposure to lethal chemicals, are compellingly detailed in the 2016 study, Kinder Morgan and Public Health, written by a group of physicians. For an overview of the project, including the federal government of Canada’s reasoning for approving it, see Justin Trudeau Approves Oil Pipeline Expansion in Canada. The province of Alberta has for decades been a powerful voice in Canadian energy policy-making, with vast reserves of oil and natural gas that it sells both to other Canadian provinces, and to international markets. Their expressed concern with B.C.’s objection to the pipeline expansion is economic. In the popular imagination, whenever we hear stories of oil workers thrown out of work or industry towns in the carbon economy falling victim to out-of-touch environmental priorities, we conjure up images of honest, no-nonsense folk working hard just to scrape out a modest living. It’s easy to forget that the average standard of living in an area like Alberta is comparatively very high. Moreover, this standard of living is based on a diversified economy, not entirely dependent on a carbon energy sector. Yet B.C. and Alberta have for a couple of years now simply been talking past one another, and getting increasingly shrill about it. I’m trying to imagine a new discussion path, whereby we can value the oil and gas resources available in Alberta, yet respect the health, safety, and environmental objections of a broad coalition of people in British Columbia and the state of Washington. Think of the oil and gas as a bank account. And not just any old checking account, but as part of a regional (and even global) nest egg. That which is saved tends to be valued even more highly. The carbon-based resources are a form of security, socked away against hard times or emergencies. We should be grinning from ear to ear that we have it, that we know how to use it for our energy needs, and that we can now keep it in the ground to save it for later. We should be proud that we can pass it along like an inheritance to future generations, not just decades down the road, but centuries. The plain, immutable fact is that carbon-based energy resources are finite. Yes, it’s lovely to discover new natural gas plays and oil fields. But no matter what, they are finite, and frankly we are already glimpsing at this finitude. Deep-water drilling has proven to be exceedingly dangerous. And, even more to the point in the debate about the Kinder Morgan pipeline, when you are champing at the bit to utilize tar sands, an extremely dirty and expensive-to-process form of oil, you know you’ve reached some kind of inflection point for energy policy. Renewables (primarily wind and solar, combined with some form of storage) should be the energy currency we are using now for day-to-day “expenses.” In places where hydro infrastructure already exists, and provides an abundant source of clean power, this can complement wind, solar, tidal, and geothermal options. Energy efficiency measures, particularly useful when scaled to large metro populations, must underlie the whole system. 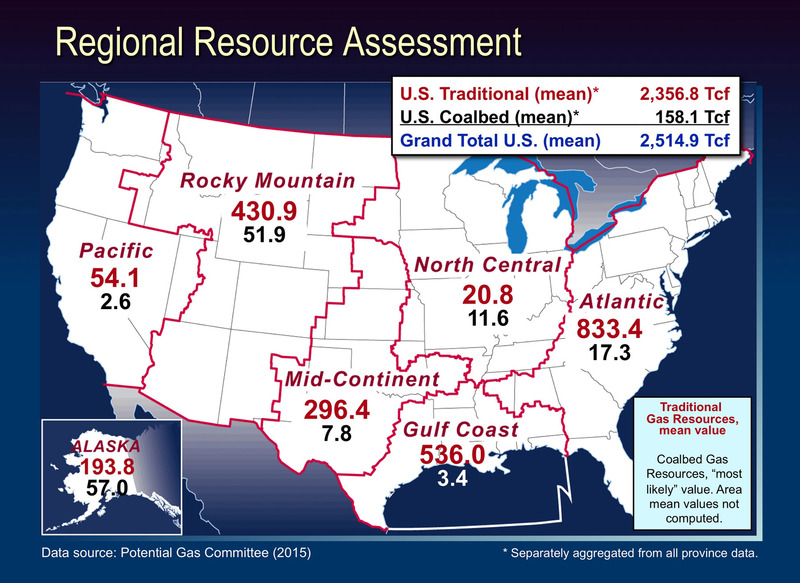 And finally, gratefully, in back of all this will be our reserves of oil and gas, hopefully never having to be used. That which is saved tends to be valued even more highly. I can imagine a new mind-set that would even consider these resources beautiful, part of our beautiful home rock, part of our loved environment. Precisely because they are kept in the ground. The data evidence is in, and it shows that solar panels have reduced my energy bills by 71 percent, with greater reductions expected for calendar year 2016. Comparison of annual bills paid to Puget Sound Energy, 2013-2015. “Adjusted energy bill” refers to the amount paid after the solar production payment is factored in. In 2013, the last calendar year in which I didn’t have the solar array, my bill from PSE totaled $1343.05, for electricity and natural gas (the furnace and water heater are powered by natural gas). In 2014, which saw the installation of the array in October, my bill from PSE totaled $1240.85. This was down approximately 8 percent from the previous year, a decrease possibly (although not definitively) associated with the transition to solar for my electricity. And in 2015, the first full calendar year in which the solar array was operative, my bill from PSE totaled $881.26. This figure is down approximately 29 percent from the previous year, and 33 percent from 2013. This shows the impact of the solar panels in and of themselves, and while it is not as dramatic a reduction as I had imagined it might be, the reason for this is clear. Heating in winter is easily the costliest component of my power portfolio, and this is supplied by natural gas, not electricity. But if you factor in the solar production payment from 2015, which was $498.30, this offsets approximately 57 percent of my power bill for that year. This “adjusted energy bill,” then, is down roughly 69 percent from the previous year, and roughly 71 percent from 2013. The array also achieved a milestone on August 30 of this year: 10 megawatts (or 10,000 kilowatts) produced in total. And as of this writing, we have eclipsed 10.5 megawatts! Two years in, I have reached a point, amazingly enough, where I consider my solar panels a routine part of my world. They quietly warm and accelerate their profusion of electrons, and I can go for days now without thinking of them at all. But then something happens that, shall we say, jolts me out of my inattention. Recently it was the deposit of some $738.64 from Puget Sound Energy into my bank account, representing its annual solar production payout for the array on my roof. The money actually originates in a state of Washington fund to incentivize the adoption of renewable energy (including solar, wind, and even anaerobic digestion applications). All the buzz over the last few months has been how dramatically an individual’s payout would be reduced this year, due to the fact that the amount in the overall fund remains constant, while the number of people participating in the renewable economy in the state is increasing substantially. But the cuts were less than anticipated: my own system, which is categorized as “solar manufactured out of state”, now pays at a rate of 14 cents per kilowatt hour produced, down only a penny from the previous year. Other categories were comparable in their marginal reductions. This is not to suggest that the future of such a fund is secure. A former mayor of Seattle, who had gone solar at approximately the same time that I did, recently decried the possibility of payout reductions from their original incentive rates as a kind of “bait-and-switch” deception of consumers. Indeed, it is commonplace to calculate a prospective solar customer’s ROI before the customer commits to the installation. Calculating incentives, tax breaks, and electricity produced, the installer can at least give you a ballpark estimate: your system will pay for itself in 15 years, say, or 10, or even 5! But if a major piece of the calculation is subject to change at each legislative session, that ROI becomes much less predictable. We’ll see how it plays out. But in the meantime, all this got me to thinking more about the economics of going solar. Next post I will go through some of the interesting data that is now accumulating from two years’ worth of having a solar array. Yesterday I had the pleasure of joining over 100 of my fellow energy policy geeks as we filled to overflow capacity the hearing room of the Washington Utilities and Transportation Commission (UTC). It was the largest crowd ever to attend a UTC hearing, and we were there to voice objections to a plan by Puget Sound Energy (PSE) to continue operation of the coal plant in Colstrip, Montana, for another two decades at least. The Sierra Club organized the activity, including transportation to and from Olympia where the commission does its work. The venerable environmental group has gotten involved because approximately 30 percent of PSE’s electricity comes from Colstrip, and PSE is the single largest owner of that plant. Among the wide array of experts and interested citizens participating in the hearing were Montana ranchers directly harmed by the pollution emanating from smokestacks and collecting in ponds around Colstrip, public officials from both Montana and Washington (Nathaniel Jones, Mayor Pro Tem of the City of Olympia, was particularly eloquent), and scientists and attorneys speaking to the degradation of water and air quality attributable to the Colstrip plant. For its part, the three-member UTC board patiently listened to some five hours of testimony, asking numerous questions and sparring occasionally with environmental attorneys when the latter seemed to be asking more of the commission than its defined charter permitted. Essentially that charter is an economic one: to determine whether a private utility can pass the cost of capital investment on to its customers via their electricity bills. But commissioners admitted that environmental and even moral arguments could ultimately factor in to their economic analysis and decisions. So, will this large-scale effort to influence the UTC amount to anything? I am genuinely encouraged that it will, at the very least, cause the commission to recommend to PSE that it revise its 20-year plan, and provide some specifics around retiring at least the two older of Colstrip’s four coal-fired boilers. A year ago yesterday I was toasting the completion of the solar array installation at my house. At the time, I knew that if I wasn’t at the cutting edge of the residential renewable energy movement, I was at least in a very small minority of homeowners who had actually purchased rooftop solar. Now we finally have a large enough sample size to look at the data and draw conclusions about the effectiveness of the installation and how it fits into the context of this home’s energy use. The sunlight hitting the surface of the 20 solar panels on my roof for a full year produced 5.5 megawatts of electricity, which is exactly what was forecast by the company that installed the system. So the system performed as expected, factoring in the location and orientation of the roof, the number and wattage rating of the SolarWorld panels, expected shading from backyard trees, and so on. I’m very appreciative to Northwest Electric and Solar, as well as Solarize Bellevue, for their honesty and accuracy in setting expectations for how the array would perform. The system averaged 15.1 kWh per day. Over time, it’s normal to see slight decreases in production, so it will be interesting to track, year-over-year, whether the system will continue to generate close to this level of production. Production was highly dependent on season, even more so than I had anticipated. For example, December was unable even to crack 4 kWh per day. June, on the other hand, soared to just over 30 kWh per day. The best six-month span (what I like to call the baseball months, April through September) produced nearly 85 percent of the total for the year. Cleaning the panels had little to no impact on production. I cleaned them myself one morning, and although I could see a difference in the appearance of the panels, I was disappointed to find no difference in the “before-and-after” numbers. However, I will likely have the array professionally cleaned just to confirm. The data bears out that this was definitely the case at our house. But it should be noted that our electricity consumption is significantly less than the average American household. The house itself is relatively small (fewer than 1400 square feet), there are only two of us living here, and we try to make energy-efficient choices in lighting, appliances, and so on. So the medium-sized array on the roof easily handled our electricity needs over the year. Earlier this year, I purchased an electric vehicle. Right now, because of a promotional perk, I’m charging it free at fast-charge stations outside the house. But eventually I will use the charger I had installed in my garage. That will most likely use up the surplus electricity from my panels, putting us back at approximately net-zero. We could always add more panels to the roof, so that production continues to stay ahead of usage. At the moment, I can’t see doing that, but it is a good reminder that solar scales at least as far as your rooftop allows! Sun money: How much do you really save on your utility bills? Some sharp-eyed readers have noticed that while I am faithfully documenting the kilowatt-hour power production of my rooftop solar array, I haven’t spent a lot of time discussing the money the panels are saving me. So in today’s post I take a sampling of bills paid to Puget Sound Energy for electricity in the years 2013-2015. It looks like going solar is slashing my electricity bill by about 60 percent. In each of the three years I looked at a seven-month range of bills spanning January to July. I figured this would give me a good mix of winter and summer, short days and long days, so as not to skew the results too wildly in either direction. During this span of months in 2013 and 2014, I didn’t have solar panels; during this span in 2015, I did have solar panels. From January to July of 2013, I paid PSE $317.86 for electricity, or about $45.41 a month. For the same months in 2014, I paid $303.97, or about $43.42 a month. Looks pretty consistent for the pre-solar figures. However, from January to July of 2015, I paid PSE only $129.13 for electricity, or about $18.45 a month. That figure includes an administrative fee and tax amounting to $8.30 a month, which will always be applied no matter how much electricity the solar panels generate. Some homeowners begrudge the utility this fee, but I actually don’t. I understand that there’s some overhead involved in managing my account. While we’re talking money, too, it’s important to remember that in the state of Washington, utilities send solar users a check once a year based on annual energy production of the customer’s array. In my case, PSE will be sending me a check for $498.30, based on 3322 kilowatt hours generated. Puget Sound Energy began recording data for the solar panel array at my house in mid-October last fall. The race was on: at what point would I be selling the utility clean power from my panels faster than I would be buying carbon-based, “dirty” power from them? Predictably, through the short, dark days of fall and winter, we needed to buy more power from PSE than we were selling back to them. Round about February, though, as I read the numbers on my meter I began to notice a change. The number of kilowatt hours returned to the grid was beginning to increase more rapidly than the number of kilowatt hours supplied by the grid. March and April confirmed the trend: the “returned” measure was chasing down the “supplied” number, slowly but surely. The dirty power we bought from PSE over the winter has now been offset by an equal amount of clean power our panels have produced and pushed out to the grid. The panels have produced power in excess of what was pushed out to the grid, enabling us to meet our household needs with renewable solar power. Of course, it is true that the calendar will inexorably move towards a less favorable solar season, again. It is possible that “net zero” is a temporary victory. What will be particularly revealing I think is how the numbers stack up exactly one year in. That will give us an annual baseline measure against which to measure future performance as well. Recently I spoke at the Solarize Bellevue ribbon-cutting event to celebrate the newly-installed solar array donated to the Boys and Girls Clubs Teen Center. It’s not often you get to share a stage with a mayor (Claudia Balducci of Bellevue), and not one but two mascots (“Blitz” from the Seattle Seahawks and someone called “Carbon Yeti”). So this was really a treat for me, and below is the speech I gave. 1) I feel a greater bond with my neighborhood and my city knowing that we did this together. Some have asked me why, after years of thinking about getting solar panels, I finally dove in with a neighborhood Solarize campaign like this one. I could have just worked directly with an installer; there are quite a few now in the Seattle area. But I like how Solarize Bellevue showed me that there are hundreds of others out there interested enough to show up at workshops around the city. It also showed me how several non-profit organizations in Bellevue wanted to get in on the fun, competing to win the prize of a free solar installation. And by the way: Congratulations to the winners of that competition, the Boys and Girls Club of Bellevue! 2) I got to know some great people. The folks behind this program are smart, fun, hard-working people, and probably the best decision I made last year was to become a volunteer for Solarize Bellevue. Bret Turner at Northwest Electric and Solar really knows his stuff, and provided detailed answers to my questions as they came up. Ian Robinson ably assisted him during the campaign, and the three installers who came out to my house to do the real work of getting my panels up and running clearly loved their work. Paul Andersson and Emma Johnson at the City of Bellevue provided invaluable management of the campaign, and of course Paula del Giudice of PPRC led the campaign with a steady hand and words of encouragement at all the right times. 3) Over the long term, I’ll be saving real money. With tax breaks, incentives, low-interest loans, and leasing, solar panels have become a reasonable, affordable home-improvement option. My own system will pay for itself within 10-15 years, and many systems now available in the state see a return-on-investment even faster than that. Just to take a quick example of the dollars and cents of going solar, let’s look at the impact of the federal renewable energy tax break. It’s a hefty 30 percent. When I signed my contract with Northwest Electric and Solar, they asked for two-thirds down and one-third on completion of the installation. At the time, I must admit I gulped a little bit as I wrote those two checks last fall. But now, just a few months later, I’ve gotten a tax refund that reflects the 30 percent renewable energy tax credit. In other words, Uncle Sam picked up nearly the whole amount of that second check I wrote. Many people now think of solar as a wise investment opportunity, and when you have a program like Solarize Bellevue, which can reduce prices by taking advantage of bulk buying, it really does make sense financially. 4) I’m doing my small part to help the environment. In thinking about solar, sometimes it helps just to take a step back and realize what a minor miracle this technology is. We can make electricity out of sunlight. Sunlight! That means that now it doesn’t make a whole lot of sense to blow up mountaintops just to get at some coal. It doesn’t make a whole lot of sense to risk life and limb to drill for oil in deep seas. It doesn’t make a whole lot of sense to have to protect ourselves against the nightmare of radiation from nuclear accidents or waste. It doesn’t make a whole lot of sense to burn carbon-emitting fossil fuels or frack the land beneath our feet. We can, at least in part, make use of that quiet and undemanding gift called sunlight. Thanks to Solarize Bellevue, I now generate half of my electricity right up on my roof. My hope is that through programs like Solarize Bellevue, and through the educational efforts of organizations like the Boys and Girls Club of Bellevue, we’ll see more and more solar panels dotting the rooftops of our city! November through February are pretty dark months in Seattle. Often you’ll leave for work before the sun comes up, and return home after the sun goes down. You might get a sunny week or two in January, but most years February’s got you searching for clinical definitions of Seasonal Affective Disorder. Because my solar array was installed last fall, I have been paying extra close attention to insolation statistics through this period, the darkest third of the year. I now have data for four full months of operation, which should essentially tell me the worst news I can hear about how my solar array is performing. 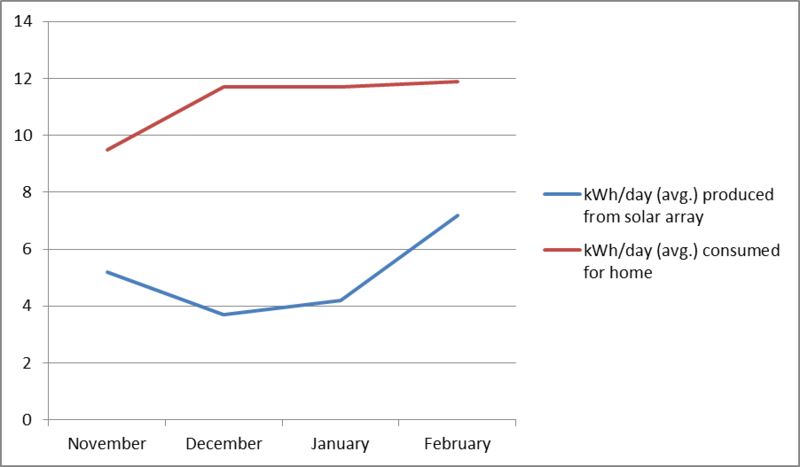 February has been the best month so far, with roughly 61% of our electricity needs powered by the solar panels. By contrast, December’s solar output offset only 32% of our electricity. Overall, we are seeing approximately 45% of our demand being supplied by solar power, with an average daily output of about 5 kWh from the renewable energy source. At some point this summer (July? August?) I bet we’ll see a crossing of those lines on the chart, indicating that solar is providing full coverage of my electricity and then some. That said, this exercise has been a good reminder to me to work on limiting my consumption, at the same time as I cross my fingers for sunny days ahead.